Seriously? OMG! WTF?The Brady Bunch Archives - Seriously? OMG! WTF? The youngest Brady Bunch kids paint their home! Last year, HGTV bought the exterior of the Brady Bunch house in Studio City, so that they can convert the inside to look like the one we know and love. They asked the network’s biggest stars like the Property Brothers to help them out. Although, they can only do so much. They need 12 more hands to finish the job. Thus, they also need the hands of Cindy, Bobby, Jan, Peter, Marcia and Greg to get dirty too in their old home. 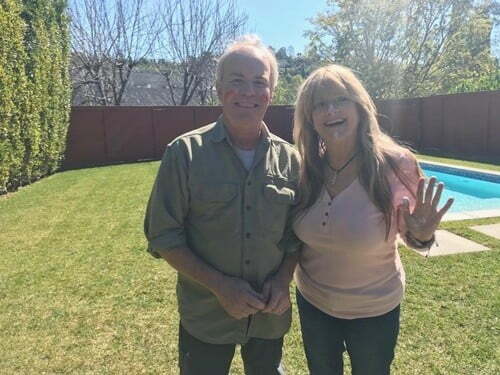 On Friday, not only did Susan Olsen and Mike Lookinland get their paws all messed up, their faces were also covered with paint and not as in makeup. Proving that even though they are nearing 60, they are still the kids we fell in love with from the beloved sitcom. Which makes me even more excited for A Very Brady Renovation that debut in September. The same much the classic show turns the big 5-0! As you have heard, HGTV is renovating the Brady Bunch house and making it look like the one we knew. There is just a slight problem. How do you find items from the 1969, fifty years later? You ask the fans to help you. That is exactly what they are doing. Therefore, HGTV listed a bunch of the items they need and they are asking if you have them. If you do, then I am sure you want to get rid of them. Not only for a greater cause but also because let’s be real, they are ugly. To see what items they need and how to contact them, then check out the A Very Brady Renovation page. The renovation is underway at The Brady Bunch house and we are getting our first glimpse at the construction being done inside. As we know, all six of the Bradys were there on day one, as were the designers that includes The Property Brothers. Anyone who watches Jonathan and Drew Scott’s show knows that the twins put the homeowners to work and the actors are not different. Just because Maureen McCormack and Christopher Knight were on the sitcom, that does not mean they are not good enough to rebuild their old house. Well, it was not technically their house, but we all think it is. Anyways, if you like seeing them getting their hands dirty, then HGTV has given plenty of ways to watch the work being down before A Very Brady Renovation debuts in September (the family show’s 50th anniversary. You can get video and photo updates on Facebook, Instagram and on HGTV. Because when it is time to change, it is time for us to see them change! Over the weekend, Buffalo held the World’s Largest Disco and several ’70s icons came out to put on their boogie shoes. The groovy celebs are The Brady Bunch’s Barry Williams, Mike Lookinland, Chris Knight, Susan Olsen with “Fake Jan” Geri Reischl, Howard Hesseman and Loni Anderson from WKRP in Cincinnati, Lisa Whelchel from The Facts of Life and Deney Terrio from Dance Fever. What a neato lineup of actors who look just as great now as they did then. Plus, they did it for a good cause because the event was to raise money for Camp Good Days & Special Times. That’s the way, uh huh, uh huh, I like it. Marsha, Marsha, Marsha takes another football to the nose! One of the most famous episodes of The Brady Bunch is when Marsha’s nose was accidentally hit by a football thrown by Peter. Her nose swelled up and all everyone cared about was Marsha, Marsha, Marsha. Now 45 years later, Christopher Knight and Maureen McCormick recreated that moment at their old house. Looks like that house will not be the only getting some renovation done to it. I love that after a nearly 50-year friendship they can still play like they did when they were kids.